Review: Revolutionary Keywords For A New Left . Authored book: Ian Parker. Publisher: Zero Books. Publishing Date: December 8, 2017. One can make a few predictions about any new book by Prof. Ian Parker. It will be intellectually daring, international in its understandings, and will draw together discourses and events often kept apart within established writing. Above all, it will not be easy to predict. 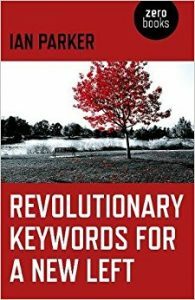 Revolutionary Keywords For A New Left is no exception. lected subjects to the discourse of the left, as through such an operation it also questions the nature of such discourse. In other words, the difficulty for Parker is not only that Williams focuses on the wrong thing, or even that his focus is not sufficiently broad, but rather that the discourse of ‘focus’ itself is at issue. Parker has written a text that, in its every aspect, problematizes a centrism that, left unchecked, can limit revolutionary possibility. The task of Revolutionary Keywords is to open up an understanding and discussion of these transformations. To achieve this end, the text rejects a conventional linear structure. Instead, fifty chapters engage with fifty keywords, some long established (‘Empire’, ‘Fascism’, ‘Discourse’), some more recent (‘Young Girl’, ‘Brexit’, ‘Cis’). The result is a text that can offer up unexpected connections. I can, for example, very much recommend reading ‘Structurelessness’, followed by ‘Identity’ and by ‘Pabloism’: the impossibility and necessity of structure; its disavowal within Capitalism; its uncanny, disruptive effects within revolutionary thinking and practice. The text is about the meeting of ‘keywords’ in a way that results in tensions between discrete terms whilst also problematising the notion of such hard-impacted distinctions. Revolutionary Keywords is, in these terms, an example of what one chapter names the ‘Prefigurative’, producing a reading that ‘anticpate[s] the world of tomorrow’. In practice, this means for example, that the chapter on ‘Discourse’ reads Foucault through the neo-liberal project of the ANC, whilst that on ‘Cis’ discusses sexuality and Ukranian identity. This is a text that does not dismiss the force of boundaries, nor the necessity of structures, but is consistently challenging and transforming what these might be, and the nature and direction of the forces upon which they call. Within Parker’s exacting critique, the tensions between the various discourses he introduces do not simply result in an appeal to comforting, liberal tolerance-inclusiveness. Rather, cultural and geographic ‘contradictions’ both enable Maltese resistance to certain monotheistic structures, and are also the marks of a colonial history now ‘intensified in the pursuit of profit’. Such reversals are consistently read in Revolutionary Keywords not in terms of pessimistic dead-ends, but rather the very stuff of critical and political movements. In this text, Parker proves himself once again a truly great reader of the dialectic. There is a reflexivity that actualises, rather than dilutes, the revolutionary politics. Indeed, this is a text that makes real political movement. It is a text that makes the call and opens up the possibility of going ‘forward’. Or, as Parker has it in his address to his audience: ‘I hope you like the book and argue with it’.